This is the sort of headline that one might see, however in this case the TV star is a seven-year-old giraffe. 'Playful and charming' Hamley, who has been an on-screen favourite for five years on TV drama Wild At Heart. 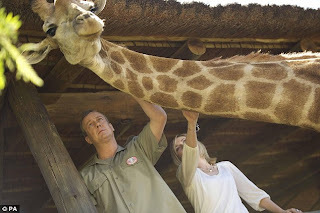 Yesterday thunderstorm killed Hamley on Monday on the Glen Afric reserve in South Africa, where the drama, which stars Stephen Tompkinson and Dawn Steele as newlyweds Danny and Alice Trevanion, is filmed. The cast did not witness the tragedy, as they were away from the reserve filming a scene for the sixth series of the ITV drama. Producer Nick Goding said: 'We are all desperately upset about the passing of Hamley, who has been part of the Wild At Heart family for five years. 'It was a natural disaster, but nevertheless heartbreaking for everyone who has been involved with him - he was a real character. Hamley had already filmed scenes, including frightening an environmental agency visitor up a tree, for the next series. A spokeswoman for the drama said of the scene: 'You can't teach wild animals how to act. But Hamley walked up to the tree afterwards where the actor was and started to lick his face. "That will stay in (the series). That was just one of his many extraordinary facets, that as a wild animal he had this natural aptitude to do what you wished for." Scottish actress Steele said she was "so sad" about the death. She said: "Hamley was a huge part of the show. We still all cannot believe that he will not be wandering around set, trying to get into the make-up truck or trying to get into every scene he could. "I cannot express how he will be missed on Wild At Heart - he was like another actor - only taller! "He touched everyone's lives on this set. I am only glad in his short life he touched so many people and left so many memories. It will not, and is not, the same without him." "Obeisant" crowns a differant Scrabble champ.